Approximately seven percent of breast cancer cases are caused by mutations in the BRCA1 or BRCA2 genes.1 Individuals who carry a mutation in either the BRCA1 or BRCA2 gene have a condition called Hereditary Breast and Ovarian Cancer (HBOC) syndrome, which is associated with an 87 percent risk of developing breast cancer by age 70.2-4 Mutation carriers who have already been diagnosed with cancer also have a significantly increased risk of developing a second cancer. 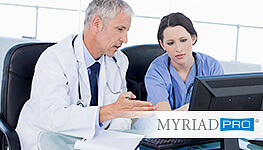 Myriad offers genetic testing that can be used to identify patients who are carriers of a BRCA1, BRCA2 or other gene mutation. 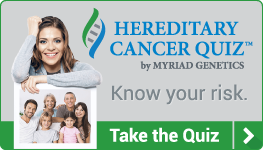 If a patient’s personal or family history indicates that he/she may be at increased risk of HBOC and other syndromes, genetic testing provides the most accurate means of assessing cancer risk. Knowing the potential risk can help you make better, more informed decisions about your patient’s health, before the onset of cancer or before a second cancer has developed. 1. Claus EB, et al. The genetic attributable risk of breast and ovarian cancer. Cancer 1996;77:2318-2324. 2. Pal T, et al. BRCA1 and BRCA2 mutations account for a large proportion of ovarian carcinoma cases. Cancer 2005;104(12):2807-2816. 3. Risch H, et al. Prevalence and penetrance of germline BRCA1 and BRCA2 mutations in a population series of 649 women with ovarian cancer. Am J Hum Genet 2001: 68:700-710. 4. Easton DF, et al. Breast and ovarian cancer incidence in BRCA1- mutation carriers. Breast Cancer Linkage Consortium. Am J Hum Genet. 1995 56:265-71. PMID: 7825587.